Stay in the heart of Dubai’s glittering financial district, with skyscraper views of the city. The Conrad Dubai lies minutes away from the Burj Khalifa and megamalls and is ideally located for trips to waterparks, traditional souks and the desert. Luxurious, contemporary rooms and suites showcase views of the Arabian Peninsula and city skyline. Relax at the 6th floor Purobeach Urban Oasis, which has a rooftop pool set in idyllic gardens with a bar. There’s an outdoor yoga pavilion, as well as a fitness centre with cutting edge Technogym equipment for staying fit. If you prefer some pampering, head to the spa which offers a selection of treatments. as well as a hammam and thermal lounge. Dine at Ballaro Restaurant, which has an international buffet with live cooking stations, as well as an Italian à la carte evening menu. The Cave Bar serves a selection of wines from around the world, as well as innovative cocktails. A range of hotel child prices applies to ages 0–5 and 6–11 years. Ballaro serves an international breakfast and lunch buffet, as well as an evening à la carte Italian menu. 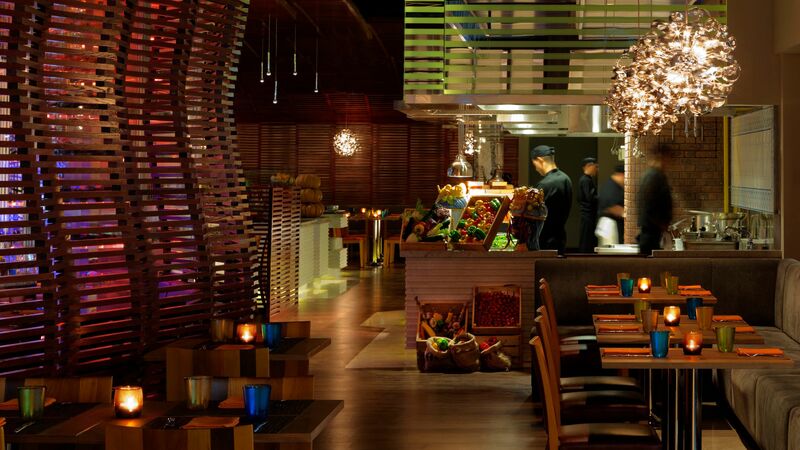 The restaurant has live cooking stations, indoor seating and an outdoor terrace overlooking the pool. Ballaro hosts themed events throughout the week, including a Street Food Night on Monday, a Seafood Market on Thursdays and a popular Friday Brunch. Open: 06:00 – 11:00, 12:30 – 15:00 and 18:30 – 23:00. 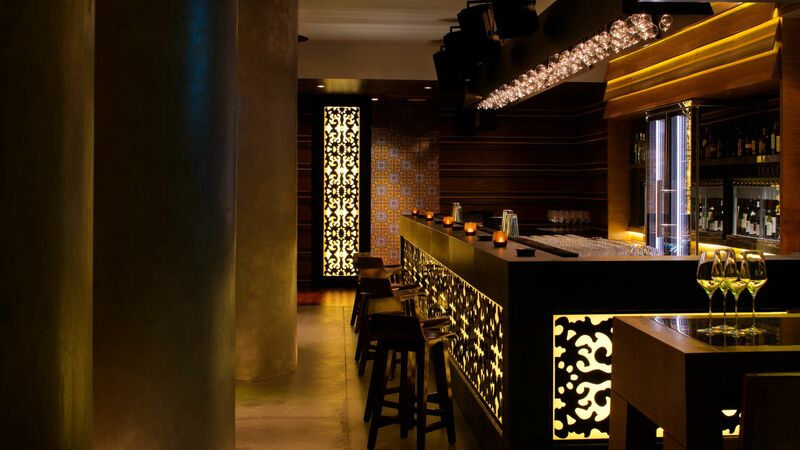 The Conrad Dubai has a contemporary wine bar, Cave, which is set on a mezzanine level. Taste top wines from around the world, as well as sophisticated cocktails and Parisian soul food. Cave features a tasting room, as well as fireside lounges and day beds. Weekly theme nights include Tapas Wednesday and cheese and wine on Thursday. Open: 12:00 – 01:00 Saturday to Thursday and 12:00 – 02:00 on Thursday and Friday. Set in the Purobeach Urban Oasis, this relaxed pool bar is set in tranquil gardens, with shaded loungers and cocoon day beds. Dine on a light menu of salads, sandwiches, burgers, pastas and grilled dishes. Sip on a refreshing daytime drink or head to Bliss 6 for a sundowner at happy hour. Open: 11:00 – 00:00, happy hour is from 18:00 – 19:00. The rooftop pool is set in Conrad Dubai’s peaceful Purobeach Urban Oasis on the 6th floor. 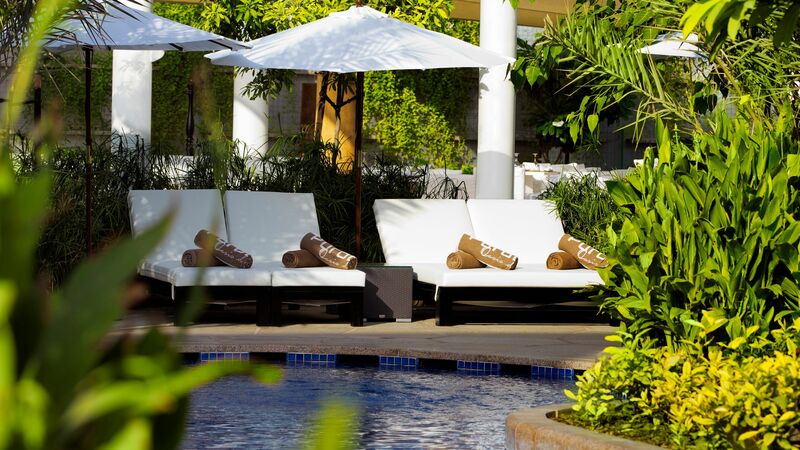 The 20 metre lap pool is surrounded by comfy loungers and day beds, with shady palm trees. Order a drink at the pool bar and enjoy evening music. 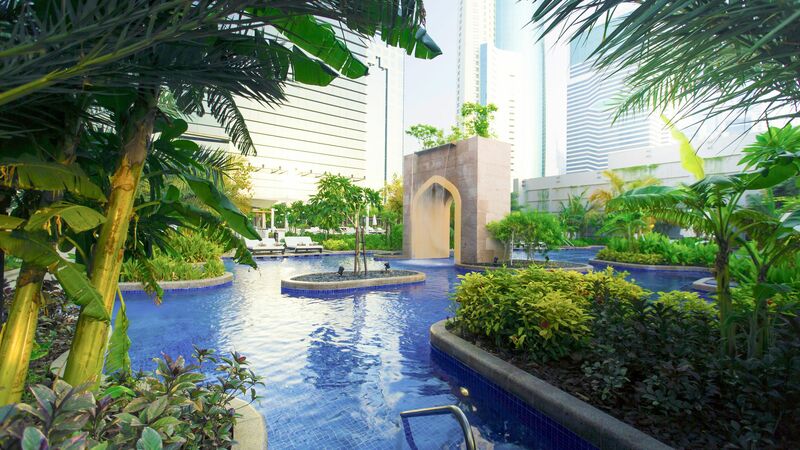 Pamper yourself at the lavish Conrad Spa, which is one of the most well equipped in Dubai. There are eight treatment rooms and two private couples’ suites, as well as a thermal lounge and hammam. Choose from a menu of opulent treatments, including aromatherapy massages and facials. 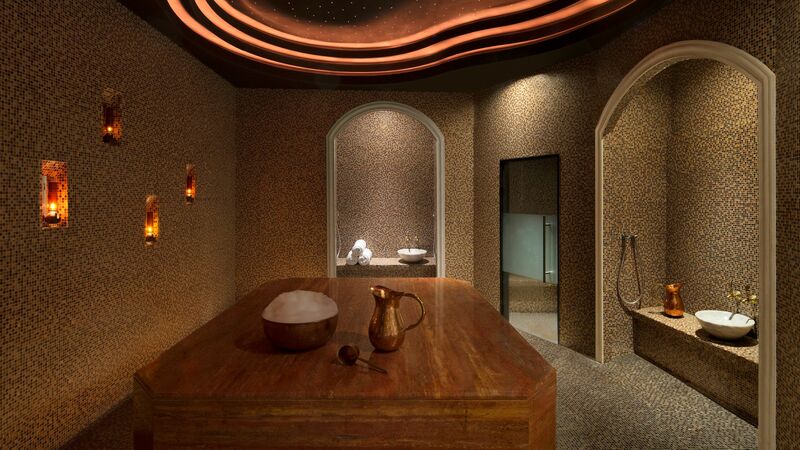 Try one of the signature treatments such as the hammam or volcanic heat experience with hot stones. Afterwards, spend some time in the hydro pools and relaxation rooms. Open: spa wet areas are open daily from 06:00 – 21:00. Treatments are available from 10:00 – 21:00. Stay active with a session at the Conrad Dubai’s fitness centre. Work out with a range of cutting edge Technogym equipment. There’s also a team of personal trainers on hand. Conrad Dubai can be found in the heart of Dubai’s opulent financial district, in the city centre. It offers spectacular views of the city from its skyscraper location, with plenty of amenities and activities within easy reach. Dubai’s famous megamalls are just 10 minutes away and offer the chance to enjoy designer shopping, as well as indoor skiing, Michelin starred dining and some excellent bars. For a sense of Dubai’s history, the city is within easy reach of the desert where you can enjoy safaris, 4x4 dune tours and falconry. Alternatively, head to the beach for the day or visit the souks for myriad spices and golden goods. The Conrad Dubai is a 20 minute drive from Dubai airport. Deluxe Skyline View Rooms come with a choice of one king or two double beds and feature sea views. The rooms feature a sitting area with sofa, bathroom with a bathtub and separate shower and a separate toilet. Facilities include air conditioning, Cable TV, iPod® docking station, safe, minibar, Nespresso® coffee machine, bathrobes and slippers, hairdryer and luxury amenities. Deluxe Sea View Rooms come with a choice of one king or two double beds and feature sea views. The rooms feature a sitting area with sofa, bathroom with a bathtub and separate shower and a separate toilet. Facilities include air conditioning, Cable TV, iPod® docking station, safe, minibar, Nespresso® coffee machine, bathrobes and slippers, hairdryer and luxury amenities. Deluxe Corner Rooms come with a choice of one king or two double beds and feature either skyline or sea views. The rooms feature sitting area with sofa, bathroom with a bathtub and separate shower and a separate toilet. Facilities include air conditioning, Cable TV, iPod® docking station, safe, minibar, Nespresso® coffee machine, bathrobes and slippers, hairdryer and luxury amenities. King Executive Rooms come with a choice of one king or two double beds and in addition to all regular facilities, guests can also enjoy access to the Executive Lounge, serving complimentary breakfast and refreshments throughout the day, also featuring complimentary wifi. Deluxe Suites measure 100m² and feature a bedroom with one king or two double beds and a separate living area. Executive Suites measure 120m² and feature a bedroom with a king size bed and separate living area, as well as in-room complimentary wifi and access to the Executive Lounge, serving complimentary breakfast and refreshments throughout the day. I don't do to many reviews, because I want people to take note when I do. This is an Excellent hotel and worth the stay. You will be treated like a VIP from the time you arrive to the time you leave. Housekeeping staff does an amazing job making sure you have everything you need (Without Asking). Excellent restaurants and pool is very relaxing. Access to tram and centrally located to malls and other sites. This hotel feels like a second home. Every time I check in the staff treats and greets me like a valued member. I love the service in this hotel because they go the extra mile to make your stay perfect. At times they can be a bit slow but the overall experience adds up for it. I'm always happy when I*m here and I'll definitely be back. Excellent service by Ihab Mounir, Naziliya and the amazing greeting staff at the entrance. Very modern hotel with large rooms and good breakfast. Staff are attentive and the pool area is lovely. Check in took quite a while which was difficult after a long overnight flight. Generally quite pricey to eat and drink in hotel but it?? ?s 20m from mono rail and easy access to local supermarket to top up on essentials.